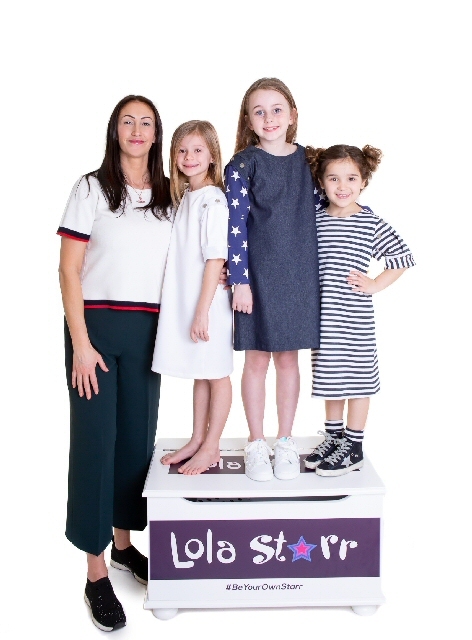 VISUAL Merchandising and Promotional Design Graduate from the Hugh Baird University Centre, Kate Hill has founded a unique exciting Liverpool children's clothing brand, Lola Starr, specialising in interchangeable clothing. The concept behind the brand Lola Starr, began whilst Kate was designing her final major project for her end of year degree show at the Hugh Baird University Centre. Kate, with extensive research and hard work, designed the concept of children's interchangeable clothing independently using knowledge she gained during her time at university. Kate received a positive response from people whom attended the degree show, including industry experts, that once she graduated she developed the brand further. The concept developed into a Children's Clothing brand, with full e-commerce website and several successful Northwest pop up shops. Kate Hill founder of Lola Starr said:- "I was a seamstress for 10 years prior to starting my degree and have always been a fashion lover, experimenting with different designs using various techniques and fabrics. Building on this passion during my time at Hugh Baird University Centre, I gained the skills and knowledge to turn my designs into a reality. The feedback from my degree show showed an interest and need for interchangeable clothing, so along with the positive feedback and my new found industry knowledge and confidence, Lola Starr was born." Kate prides her designs being manufactured here in the UK, and plays an active role in visiting her UK based manufacturers to see the factories and meet the people making her garments. As well as having a British made brand, Kate also actively promotes sustainability within Lola Starr. The brand encourages consumers not to waste clothes and re use what they have by pairing it with a Lola Starr item. As part of her research Kate has travelled around Britain with Lola Starr taking part in trade shows and participating in forums. Alongside this Kate is a member of the Make It British team and makes sure that all the fabrics are ethically scoured. This July Kate will be participating in her first trade show, PURE in London and is currently looking into working with key retailers who share her values and passion, with her sustainable brand. Angela O'Brien, course leader for the BA (Hons) and Foundation Degree in Visual Merchandising and Promotional Design courses, approved by the University of Central Lancashire said;- "I am immensely proud of what Kate has gone on to achieve since finishing her degree here at the Hugh Baird University Centre. It is exciting to see the concept she developed for her final year degree show coming to life in the brand of Lola Starr. As part of the Visual Merchandising and Promotional Design courses we actively encourage students to focus on life after university to ensure they leave career ready. Kate has shown that if you put in the hard work you can achieve your dreams and she is an inspiration to our current students. I wish Kate every success with Lola Starr." The Visual Merchandising and Promotional Design courses at the Hugh Baird University Centre are approved by the University of Central Lancashire (UCLan). For more information please visit:- HughBaird.AC.UK/University-Centre or call:- 0151 353 4444. STAFF at Merseyrail have pledged their support to help Alder Hey Children's Charity fund projects to entertain patients who might be daunted by the idea of a trip to Hospital. Employees voted for Alder Hey to be Merseyrail's Charity of the Year for 2019 to 2020, after whittling their initial nominations down to a shortlist of 8. Merseyrail kickstarted its fundraising activity with a ₤10,000 boost which will directly fund more visits from Alder Hey's resident magician, Barrington Powell, who distracts and entertains children in waiting areas and clinics with his amazing tricks. The partnership will help fund further distraction across the Hospital, with projects including funding to fit treatment rooms with distraction aids such as wall coverings. The fundraising activity will also help to fund a range of sensory toys and aids which will benefit Alder Hey patients. Some children, due to the nature of their conditions, find playing difficult and therefore require toys that are designed to give stimulation in a specific way. As well as offering play opportunities, these toys can offer comfort, relaxation, stimulation and learning opportunities. Distraction and play is hugely important at Alder Hey as it not only reduces the time spent in an appointment, meaning that staff can treat more children each day, but it also reduces anxiety and boredom during treatment too. Andy Heath, Merseyrail's Managing Director said:- "Alder Hey Children's Hospital delivers life-saving treatment to children and young people across the Region and beyond, and we're delighted that staff across Merseyrail, many of whom have experienced first-hand the services that Alder Hey provides, have chosen the charity arm as our Charity of the Year for 2019 to 2020. We're very much looking forward to working with Alder Hey over the next 12 months, and to supporting the charity's valuable efforts to improve the lives of the children whom it serves." Merseyrail staff's 1st major fundraising event will take place during this year's Randox Health Grand National Festival, when volunteers will be at both Aintree and Liverpool Central, across all 3 days with collection buckets. 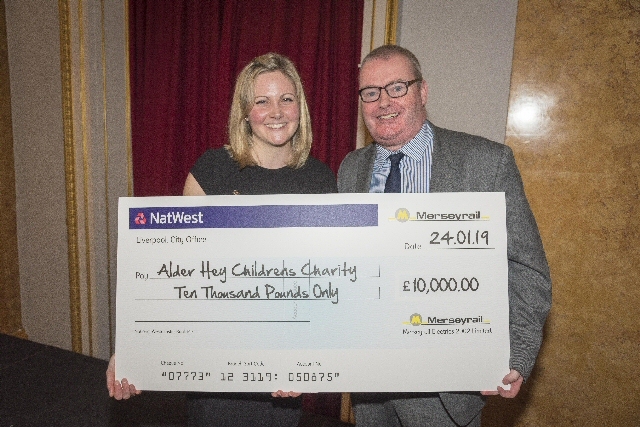 Elinor Freestone, Corporate Account Manager from Alder Hey Children's Charity said:- "We are delighted that Merseyrail staff voted to support Alder Hey Children's Charity in 2019/20. The money raised will go directly to ensure that we provide the best possible journey for all our patients"